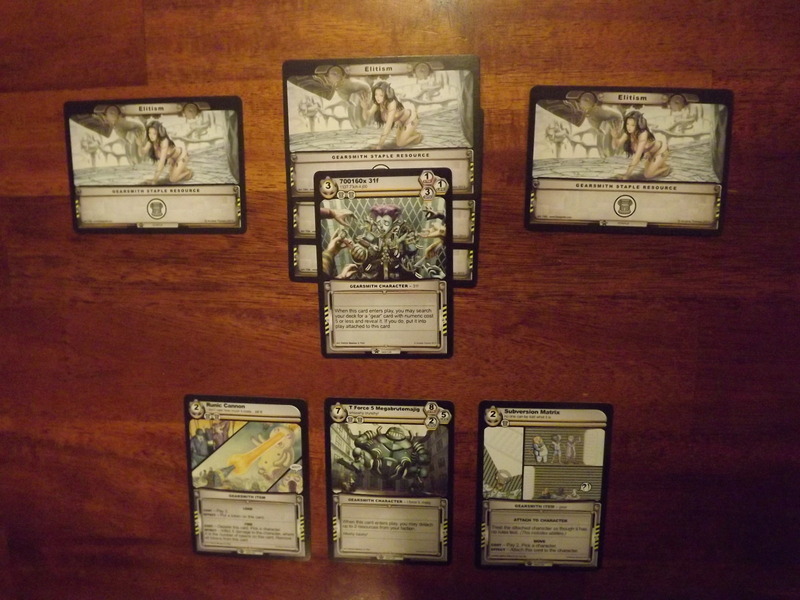 The Spoils is played out over a series of back and forth turns until one of the player’s factions has reached zero influence and loses the game. You win by playing resources, characters and tactics, and using those to attack and outwit your opponent. The turn begins with the player removing any damage sustained to characters on the previous turn, readying all cards that were used (depleted) in the prior turn, and either drawing a card from your deck or playing a resource from your hand. After this, the main portion of the turn begins. You are now able to use your faction’s abilities, play a card from your hand, use abilities on the cards already in play, and attack. Provided you can satisfy the costs, you can do as many of these actions as you want and in any order you wish . Attaching resources to a character that has just been played. Combat in The Spoils involves declaring your attack and choosing any of your unused characters to form an attacking party. Your opponent then may choose any of their unused characters to block. At any point during the combat both you and your opponent can play tactics or abilities to help or hinder the outcome of the attack. Attacking characters are then broken into “speed groups” (match the speed value of the cards and group them accordingly) and the group with the highest speed attacks first. All the characters in the first group then assign their damage (strength) to the blocking party and the blocking party does the same. All the assigned damage is now inflicted and all destroyed characters leave play. These steps then repeat for every speed group the attacker has. Once your turn has ended and nothing else can be played, it is then passed to your opponent and the game continues until one player is victorious. It is difficult to play any collectible card game (CCG) without comparing it to Magic: The Gathering. It’s the most popular CCG on the market and has been around for over 20 years. Everyone I know has played M:TG at some point in their lives and it personally was the first non-mainstream game I ever got into. I don’t want to rely on the comparison between the two, but The Spoils is obviously influenced by M:TG, and to not mention that I believe would be a disservice. The main mechanics are very similar and if you are a M:TG player, you won’t have any issue picking up the rules of this game. 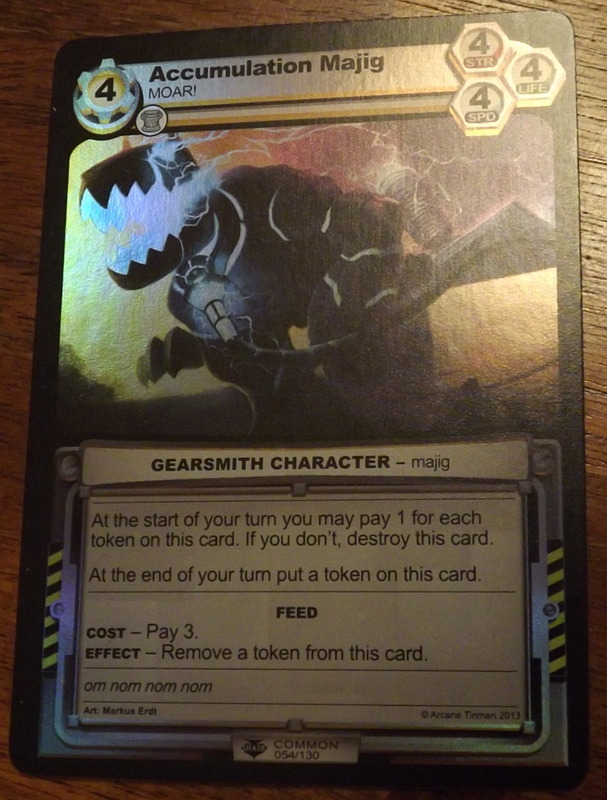 That being said, The Spoils seems to have kept everything I enjoy from M:TG and left out everything that I have found can be frustrating about it. A trait that is different in The Spoils to most collectible card games is that you never feel like you have too many or too little resources. This is one of the problems that can plague a game and gives a distinct advantage to a player. I have had many games where I have drawn nothing but resources and have been massacred by my opponent because of this. It not only felt unfair to me, but to my opponent as well; it isn’t much of a challenge to beat someone who doesn’t have anything to fight back with! With this game however, you always feel like you have enough resources to play with. First off, your faction automatically starts you with two resources (this may vary depending on your faction card). This is great as it eliminates the usual first couple of turns where nothing really happens. You basically get to jump right into the gameplay and start playing characters and traits right from the beginning. Any card you hold can also be played face down as a resource. A player can either choose to sacrifice an undesirable card to give them that extra resource they sorely need to play an amazing one, or they can play a card with a flip ability. This dynamic leads to a nice amount of tension. 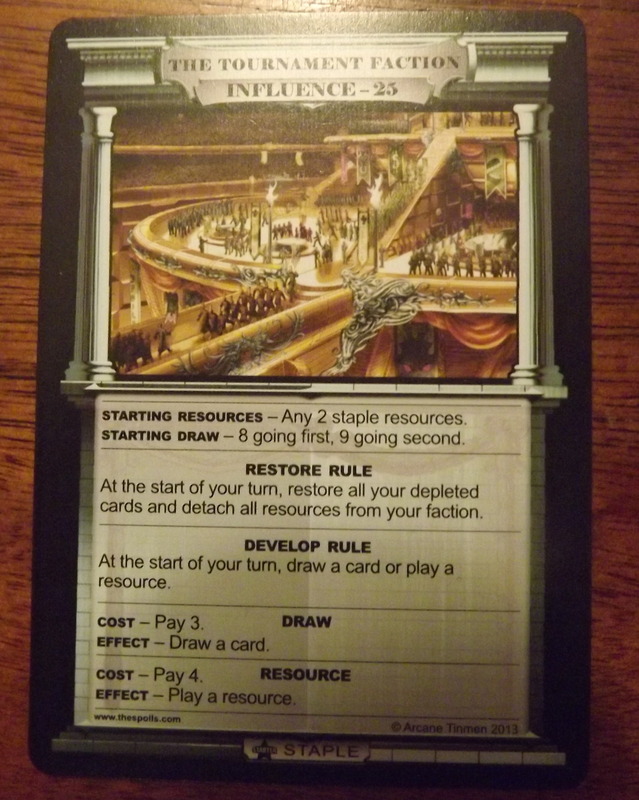 You are left questioning whether the card your opponent just played face down as a resource will flip over and do something horrible to you in the next few turns, or if it is just a throw away he or she played to get a required resource. Combat in The Spoils system I found provides more choices and is more interesting for both the attacker and the blocker. It allows for less obvious tactics and choices and leaves a lot more ambiguity on both sides. Since you can make as many attacks as you want, and play hidden tactics at any point (as long as you have the resources), it leads to a more strategic combat as you are never sure what possible tricks your opponent could have up their sleeve. An obvious obliteration on the table could very well be rendered into nothing serious by a well-played series of tactics cards. Speed has also been introduced into the combat system, which is something I found to be an interesting dynamic. A faster character might kill a slower one before it is even able to strike back. This adds another layer of strategy to the game as it could allow quick, small characters to gang up on a large one to kill it without having those characters dying in the process. Any card game that contains shuffling is going to have a small amount of luck involved, just with the drawing of the cards. The Spoils is no different, and no matter how well your deck is constructed you will always have this random factor to deal with. However, this game does its best to mitigate that luck, and it does it well. I never felt that I had gotten a poor draw, and I never felt that I had no chance in winning. That makes you want to play again. It makes you want to alter your decks and refine your strategy. I never got the feeling that no matter what I played I would never win against an opponent’s deck. There are so many choices to be made and so many ways of playing each faction, the possibilities are endless. The Tournament Faction card tells you what you need to know! 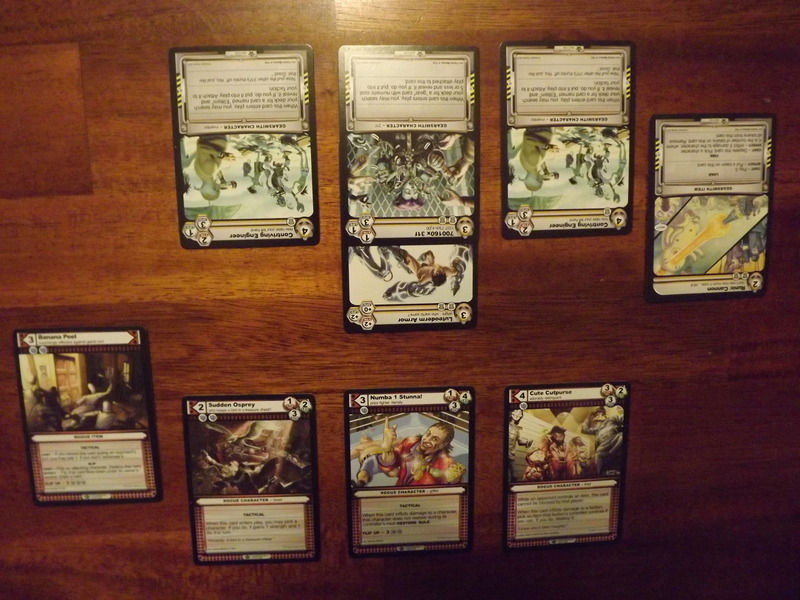 The base box that I was playing with comes with 5 different factions that each contain 39 cards. The factions are the Arcanists, Bankers, Gearsmiths, Rogues, and Warlords. 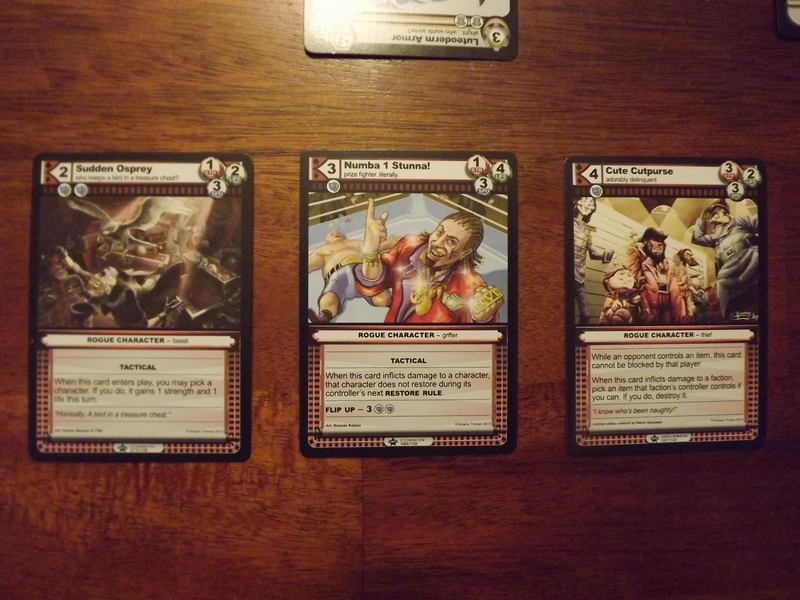 You also get 5 “Tournament” faction cards, which gives you your specific rules for the game. I think they did this to start everyone on an even playing field, and once you get more into the game you can start adding the unique faction cards to your decks. By giving you the 5 factions, the game allows you the opportunity to mix and match to find a play style that you enjoy. These decks are essentially pre-made, but it allows for you to explore your options and add onto the decks that you find most appealing. I actually enjoy this aspect as opposed to only having 2 pre-made 75 card decks. It felt like I had more control over what I wanted to play as each faction has a distinct style and feel to them. Each plays very differently and can complement each other in different ways. The Accumulation Majig loooooves to om nom nom! The artwork on the cards is fantastic, and it blends well with the theme. Both my opponent and I loved the twisted and bizarre fantasy world of the game and enjoyed how thematic and immersive it was. The art really helped portray that. It is a very strange and dark game but it’s also extremely funny. The Spoils puts comedy front and center and right next to the twisted and bizarre. It really appealed to me how delightfully quirky it was. Refreshingly, The Spoils doesn’t take itself too seriously. Iconography and the layouts of the cards are really well done, and easy to understand at a glance. It is nice that a quick look at the cards can show you what you need to know. The cards themselves are sturdy and shuffle well, they feel nice and are not too flimsy, and they won’t slide around on you as you are playing. 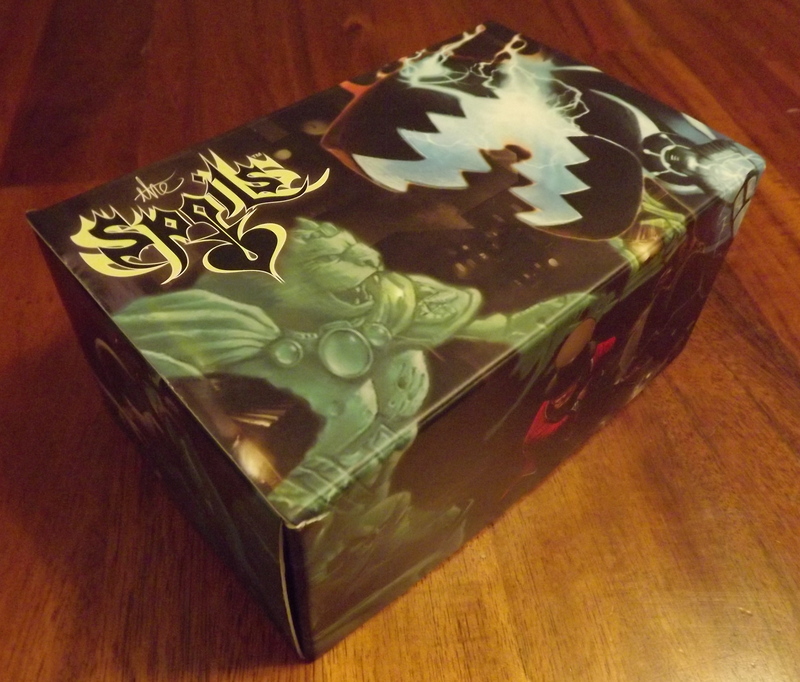 Deck expansion is a must with any CCG and The Spoils box leaves you enough room for your decks to grow. No game I have found is perfect and The Spoils is no exception. The fact that it is a collectible card game could be a huge turn off to some people. Buying countless booster packs or expensive single cards to get your deck to where you want it to be, can be a hassle as well as pricy. Some people just want to pick up a game and play it and even though you can do that with the base box, to get the most out of the game you will need to expand on it. All though the artwork on the cards is wonderful and works well with the game, it is on the more mature side. 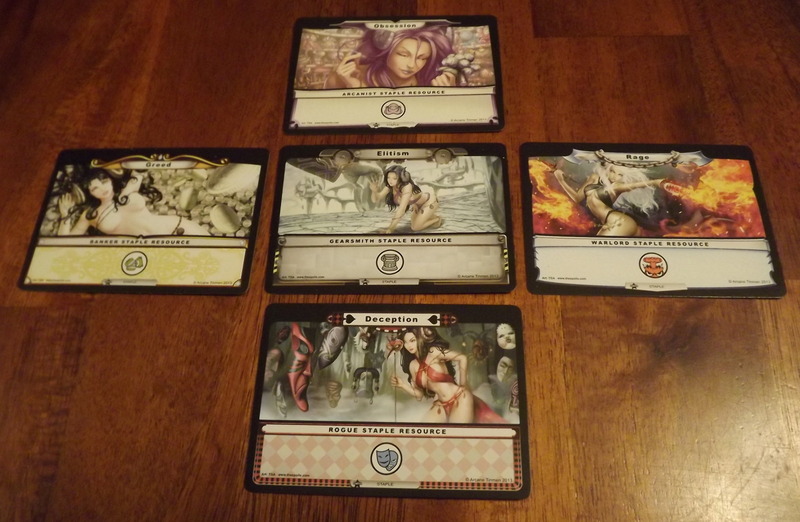 There are scantily clad women on a lot of the cards as well as some violent imagery. Some of the card names and jokes themselves are provocative and are probably better suited for an older crowd. These aspects may not offend everyone, but I can see others being put off by this sort of style. The game would be solid without it, but I understand the direction that the game makers wanted to take with having a more adult CCG. I had a few issues with the rules themselves and it took me a bit to understand the flow of the game. Even with my background with CCGs, I had to look into the combat rules a few times before I fully understood them. I believe they could have made them a bit simpler to grasp. The rules that come in the box are only “starter” rules and to get more into different situations that may arise, you have to look online. I wish they would have just put the complete rules in the box, but this is a pretty minor complaint. Overall I had a blast with this game. It took everything I think is great from Magic: The Gathering, but made it into a uniquely fun game. The twisted world of The Spoils drew me in and the solid gameplay hooked me. Although the collectible aspect may be problematic for some, I had enough fun with this game that I could justify one more CCG in my life. iSlaytheDragon would like to thank Arcane Timen for providing a review copy of The Spoils. Artwork and theme is for a mature audience.